The Basenji is loving, playful, alert, curious and intelligent. He's known as the "Barkless Dog," but is not completely silent, being able to make a variety of sounds including howls and yodels. He isn't a great watchdog because he doesn't bark so he won't raise the alarm. He loves to be petted and hugged and keeps close to his family. He wants to be with people, but is aloof and reserved with strangers. He needs frequent attention because he is an active dog who loves to explore and run: this means daily walks and exercise. If left alone with nothing to do, he might start chewing things he shouldn't. Chew toys are a good idea for a Basenji. He shouldn't be left alone in a fenced yard, since he can jump or even climb a fence to chase after other animals or to discover what's happening on the other side. He is very quick and quite powerful. For this reason he also needs to be kept securely on a leash while out walking. He can be quite difficult to train because of his strong and independent streak. He will frequently lick himself all over to keep clean. His skin is odorless, so he won't smell up your home like some breeds. He is good with children if raised with them as a puppy, and can live with other pets if raised with them as well. He can live in an apartment if he is walked and exercised daily. He doesn't shed to much but you will find hair around the home here and there. The Basenji is 15 to 17 inches tall (to shoulders) and weighs 21 to 26 pounds. He has a short, fine-haired coat. His coat color can be red, black, black and tan, or tri-colored with some white. The Basenji's coat only needs to be brushed occasionally as it doesn't tangle or shed very much. Some Basenji's will shed more then others and these will need to brushed more frequently if finding hair around the home offends you. The Basenji is one of the oldest known dog breeds, and originated as a hunting dog in Central Africa. 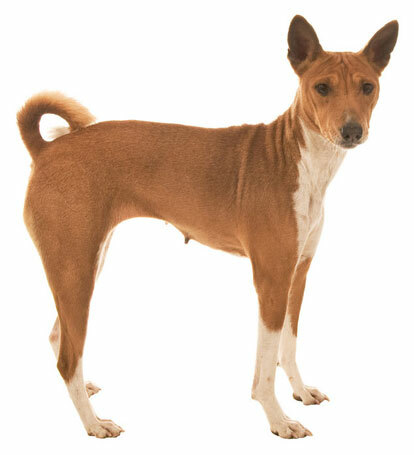 Images of the Basenji can be found in Egyptian tombs. The breed was brought from Africa to England in 1895, then died out and had to be brought back again in 1937. The first American litter of Basenjis was born in 1941. His AKC popularity was 89th out of 157 breeds in 2007.